250 stickers. All the villains you love to hate. 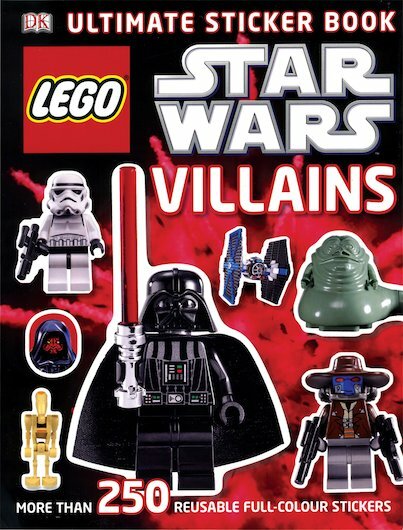 All your favourite baddies from the LEGO Star Wars galaxy. If they’re mad, bad and dangerous to know, this is where you’ll find them. Fed up of being good? Here’s your chance to explore the dark side of the Star Wars story. Dozens of sizzling colour action scenes stuffed with cool stickers. Darth Vader, General Grievous, Jabba the Hutt and their armies, starships and weapons. Naughty but so nice. This sticker book has all the great stickers to stick in the silhouette of that thing. From my point of view this book is a bit boring because all you do is stick stickers in but if you like that kind of thing then this is the book for you!